Saudi Arabia is steeply cutting its oil production, and the United States is about to, for reasons explained below. Venezuelan production keeps cratering further, Libya is in a full-blown civil war, and Iran sanction waivers expire in May. Technicals and sentiment support the fundamentals. Even though oil is short-term overbought, the pullback should be mild. Is this oil rally the real thing, or are we in another head fake just before another fall to the low $50s? We can take a look at supply fundamentals, technicals and sentiment to try and triangulate whether this current oil rally has legs or not. We’ll begin with supply fundamentals out of the three biggest oil producers in the world: Russia, Saudi Arabia, and the United States. The Russian signal we have from the production side is actually quite bearish. Russia is pumping oil at all-time record highs of over 11 million barrels a day. Worse still for oil prices, Russia has not substantially cut oil production since the fall of the Soviet Union. Even the oil crash from July 2008 to early 2009 barely made a dent in Russian production. See below. For all intents and purposes, Russia pumps as much oil as it can, and will continue doing so. Any production cuts can be expected to be trivial. The story changes though with Saudi Arabia and the United States, though the factors that induce these countries to cut production are very different. For the Saudis, pumping oil at pretty much any price is profitable, given the extremely low marginal cost per barrel for ARAMCO is about $4. So, how much to pump is basically a centralized policy decision, a top-down directive induced by the Kingdom’s national budget constraints. For the US though, it’s a decentralized market-based decision related to the various debt levels and balance sheets of the production companies involved. Production cuts out of Saudi Arabia have been very substantial since the most recent oil crash. In fact, the current rate of oil production cuts - 1.3 million barrels per day in 4 months - is on track to outpace the production cuts of 2008 of 1.6 million in six months. Current cuts are by far the largest since then. By contrast, cuts were barely noticeable following the oil crash of late 2014. The fact that these steep cuts are happening in the face of President Trump’s tweeting protests indicate that the Saudis are no longer sympathetic to his appeals. As for the United States, crude oil production remains at record levels. Will they soon fall is the question, and by how much? The last significant cuts of about 500,000 barrels a day were entirely market-induced, from mid-2015 to early 2016. Oil market analyst Peter Verleger, whom I have quoted before regarding his $200 per barrel prediction in the backdrop of new International Maritime Organization sulfur regulations taking effect next year, has pointed to a precipitous drop in the issuance of debt and equity by US shale firms in 2018 to less than half the amount raised in 2016, when oil reached lows of $26 and only ephemerally broke $50. The import of this, as he describes, is that oil firms typically raise debt to fund production and then pay back their loans with revenues from the oil they pump. Therefore, future production is in proportion to current debt issuance, with a time lag, in his estimation, of about 2 years. Based on these assumptions, he believes a steep 3-6 million barrel per day drop is likely to occur by the end of 2020. This doesn’t even take into account the disruption caused by new sulfur regulations beginning in January, which would affect the demand side of the equation. Further on the supply side is the worsening civil war in Libya and the continuing national suicide of Venezuela. Libya’s production most recently was just under 1 million barrels a day, and the civil war following Muamar Gaddafi’s assassination brought production down to just 7 barrels a day. Not 7,000, just 7. Venezuela, meanwhile, has just suffered the steepest production declines since the PDVSA strike of 2003, and the way things are going there, it will only get worse. Iran’s oil production still has not dropped significantly, meaning sanctions have yet to seriously kick in there. Iran sanctions waivers issued by the Trump Administration expire in May. Chartistry is artistry and should only be used to back up fundamentals, in my view, so I’ll just mention the basics. Oil is obviously short-term overbought, the monster rally since the beginning of the year bringing the 14-day RSI to overbought levels for the first time since the October peak at $75. In that sense, we are probably in for a short-term decline, as seems to be happening this morning, April 11. On the other hand, the 200-DMA was decisively broken through on April 2 and tested twice successfully. It is now on the verge of turning up again for the first time since November. What we should pay attention to here is the coming short-term decline from overbought RSI levels. If oil falls back through the 200-DMA, we could see lower prices for the next month or two. But if international developments fire up speculators still further, we could see one more burst higher and then a correction to bounce off the 200-DMA again. That would be very bullish and also fall in line with the supply fundamentals laid out here as we fast approach 2020. This, as well, should only be used to back up fundamentals rather than be a primary indicator. Surprisingly, sentiment is only now starting to turn bullish, as pointed out on April 10 by Standard Chartered. If it took a 51% rally for speculative funds to finally turn bullish, then this points to the upcoming decline to work off overbought conditions and newly bullish sentiment being quite mild and short-term. 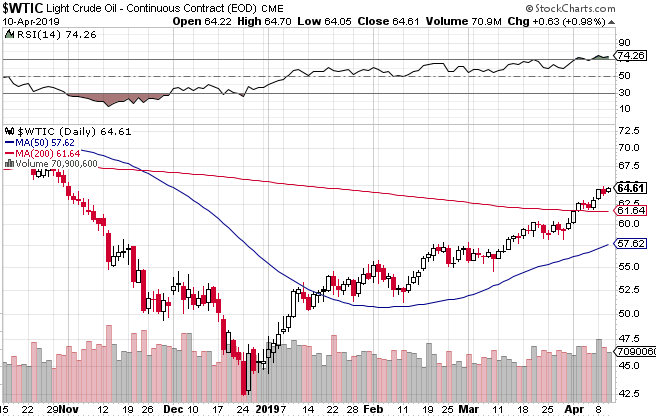 The conclusion being, oil is due for a correction, but with supply fundamentals as they are and demand fundamentals about to shocked as new January sulfur regulations approach, the correction probably will not be very deep and could even stop at or near the 200DMA before the next leg up begins. In my previous assessment of the oil market in November, I wrote that this may be the last time one can buy oil at below $60 a barrel. We may very briefly dip below $60 during the upcoming correction, with a downside target at the 50-DMA currently at $57.40, but I’m basically sticking to that call. Disclosure: I am/we are long USO. I wrote this article myself, and it expresses my own opinions. I am not receiving compensation for it (other than from Seeking Alpha). I have no business relationship with any company whose stock is mentioned in this article.